Children start learning about relationships from birth. As they get older, their relationship circle grows beyond their family to include friends and other children their age, teachers, teammates and the community. 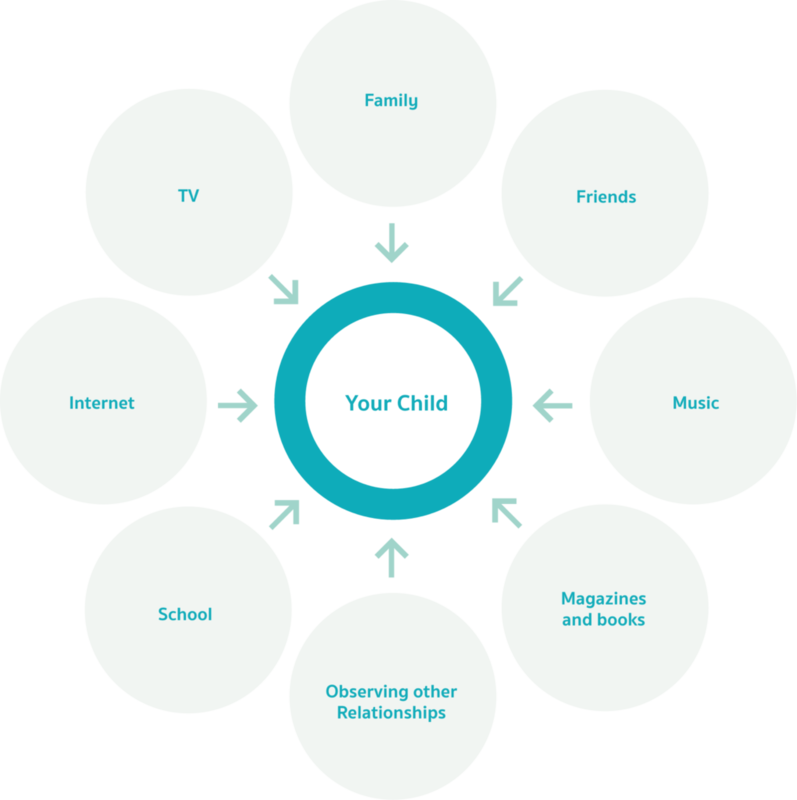 The picture below shows just how many places your child will learn about relationships. Now is a good time to think about your own values and behaviours around relationships. Start by thinking about your values and the values you want to pass onto your children. Take some time to see if you’re using behaviours that match your values. Children learn by example, and you’re their biggest influence. treat people with respect: how to speak and solve problems in a respectful way. This will teach your child how to treat people with respect. It also teaches your child to know when they’re being treated with respect—or not. manage anger: how to deal with anger in a positive, healthy, non-violent way. problem-solve: how to break problems down, find possible solutions and think about possible outcomes for each solution. negotiate, compromise and agree to differ: how to try turning problems into ‘win-win’ situations, where each person gets some of what they want. It’s important for them to know when to ‘agree to disagree’ and that its okay for people have a view different from yours. Learning to understand and respect others is what’s important. Be assertive, not aggressive: being assertive is asking for what you want clearly and respectfully, without threats or physical force. Assertive communication means that you respect the rights of others, as well as your own. As your child gets older, they’ll start to have different types of relationships. It’s important that your child knows that no one has the right to force them to do anything they don’t want to do. Here are a few topics that you might want to talk about with your child and also keep in mind as a parent. Children may feel pressure from other children or intimate partner to do something they aren’t comfortable doing. Talk to your child about how to be assertive and how to say ‘no’. This will help them become more confident and stay true to their values. Clink the link to learn about Understanding Consent. It’s important to teach your child to choose their friends wisely. Talk to your child about the qualities a friend or someone they’re intimate with should have. Help your child to look for relationships with shared respect, honesty, loyalty, trust and kindness. It’s important to remind your child that their friends should treat them and others kindly. Talk to your child about what a healthy, unhealthy and abusive relationship includes. People have different kinds of relationships throughout their lives: Some examples include relationships with family, friends, classmates, and teammates. As children get older, it can include sexual or intimate relationships. Understanding the differences between healthy, unhealthy and abusive relationships will help you model and teach your child the difference between them all. Below are the traits of healthy, unhealthy and abusive relationships. Most of these traits can relate to any kind of relationship, but a few deal with romantic or intimate relationships. Sharing feelings: Both people feel safe and strong enough to tell each other how they really feel. Both people are comfortable talking about their feelings and needs. Communicating: People feel comfortable talking about all types of issues. Each person is also comfortable listening to the other person. Each person shows respect when listening to the other. Non-verbal communication is also important. This includes body language, tone of voice and facial expressions. Disagreements: Each person has equal say in the relationship. They may have disagreements and still talk respectfully to each other. They work things out together, so they both get what they need. Boundaries: Each person understands healthy limits. These include physical boundaries (touching, distance when standing together), emotional boundaries (each partner keeps personal information private) and sexual boundaries (each partner is able to express needs and limits). Intimacy and sexual activity: Both partners can be honest about how they feel about sexual activity. Neither partner feels pressured to do anything they don’t want to do. Time alone: Both people can spend time alone and think of this as a healthy part of the relationship. Self-nurturing: Both partners take time to care for themselves. This includes hobbies, friendships and time alone. Taking time to think about the relationship is seen as a way to help make the relationship stronger. Verbal abuse: There are no put downs, name calling or harsh criticism. Violence: There’s no physical violence or threat of violence in the relationship. Neither person feels at risk of being hurt by the other. Both people behave in ways that keep the other safe. Sharing feelings: People feel awkward or don’t feel comfortable telling each other how they really feel. Communicating: One person ignores the other and doesn’t respect opinions different from theirs. Disagreements: Disagreements often turn into fights that include yelling, criticism or harsh words. Boundaries: Healthy limits aren’t valued. One partner may feel that physical or emotional boundaries aren’t respected or aren’t seen as necessary. Sexual boundaries may not be talked about or respected. Intimacy and sexual activity: One partner is embarrassed to say how they feel or what they need. This makes the other person go along with things that they may not be comfortable with. Time alone: One person thinks there may be something wrong if the other person wants to do things without him or her. One person tries to keep the other to him or herself. Verbal abuse and violence: There’ve been a few times when harsh or unkind language was used, and one person felt at risk of harm; however, there’s no clear pattern of abuse or violence. Sharing feelings: One person is afraid to tell the other how they really feel. They’re scared of being ‘put down’ or threatened. Communicating: One person treats the other with disrespect. They ignore the other person’s ideas and feelings or makes fun of them. Disagreements: One person is afraid to disagree because they don’t want the other person to get angry and violent. The disagreement is used as an excuse for physical, verbal or sexual abuse. Boundaries: Healthy limits are seen as a threat to the relationship. Physical or emotional boundaries are regularly crossed. Sexual boundaries are seen as resistance and may lead to physical, verbal or sexual abuse. Intimacy and sexual activity: One partner ignores the other person’s needs and wants. The other partner is pushed into doing things that make them feel uncomfortable, afraid or ashamed. Time alone: One person doesn’t let the other spend time doing things on their own because it’s seen as a threat to the relationship. Financial control: One partner controls the money. One partner isn’t “allowed” to spend the money they’ve earned, to keep their own pay cheque, to work to make money or use their bank accounts. Verbal abuse: There’s a pattern of increasing or ongoing verbal or psychological abuse (e.g., damaging belongings, name calling, threats to hurt or kill the person or someone in the family). Violence: There’s an increasing or ongoing pattern of pushing, slapping, shaking, choking, punching or forced sexual contact. It’s common for teens to have mood swings and to try out different behaviours. However, sudden changes in your child’s attitude or behaviour could be a sign that something more serious is going on. If you think this may be the case, talk to your teen to find out more.